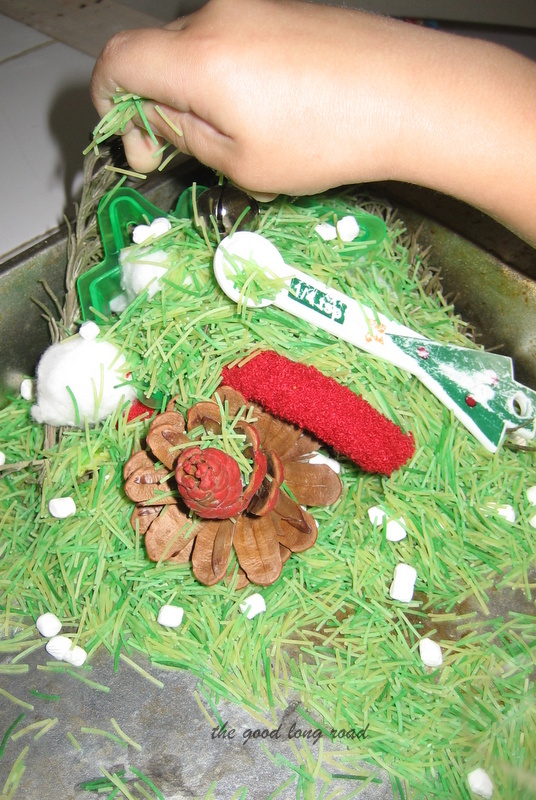 With our Christmas Sensory Bin, Wild Thing explored how Christmas sounds, feels, tastes, smells and looks, and we made it for basically $4 using items we already had as well as few things from the dollar store. 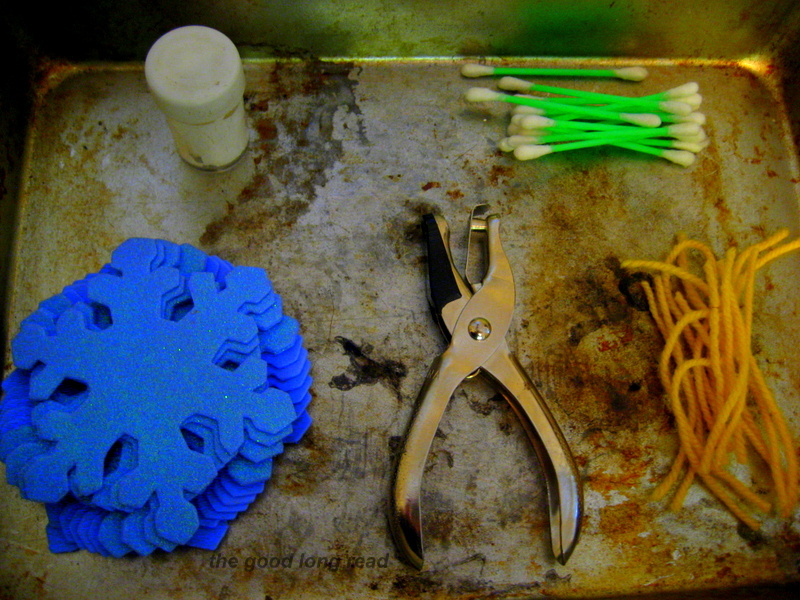 I rarely introduce food into play in non-edible ways, for various reasons, but did select to use colored pasta in this bin to represent pine needles. 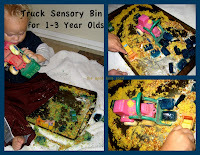 With our Fall Sensory Bins (when I made 3 for $5), I discovered how fun it was to include Wild Thing in the process of making the bin, so I had him help this time, too, particularly with making the colored pasta. 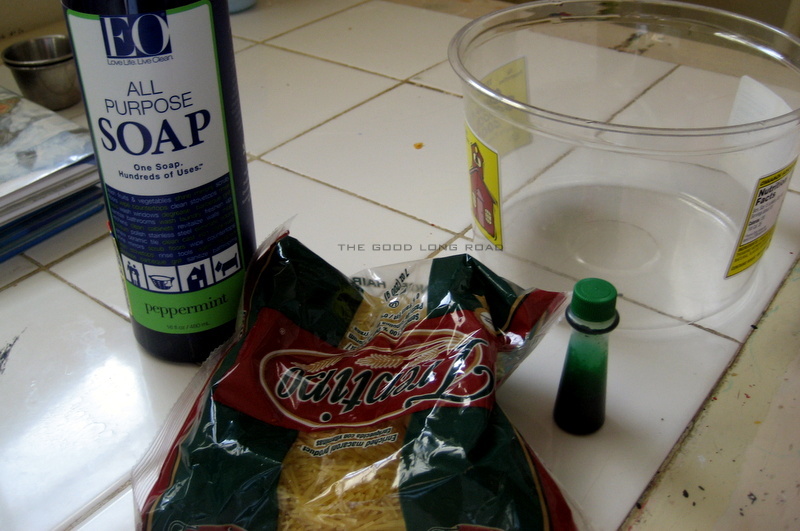 Our 50 cent bag of pasta, food coloring and some peppermint soap I happened to have. Wild Thing put several drops of food coloring and soap in this container and shook it. Then he spread the pasta out on parchment paper on a cookie sheet. 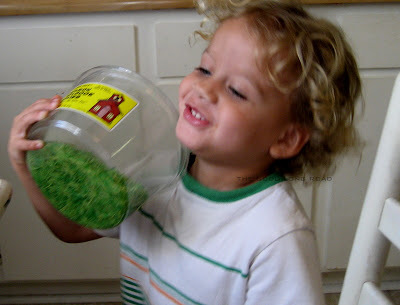 He did not get every piece of pasta turned green, but he did have lots of fun and actually liked seeing the different shades - yellow, light green and a darker green of the pasta. Using soap is not common when dying pasta, but I wanted our bin to have the peppermint smell, so I decided to add it as the binder rather than vinegar or hand sanitizer or some of the other items typically used. Love Play and Learn and Nurture Store both have useful details on coloring pasta and ended up with better results than we did. Scented Cinnamon Candles to represent the smell and lights (look) of Christmas (I got a packet of four of these candles for $1 at the dollar store). 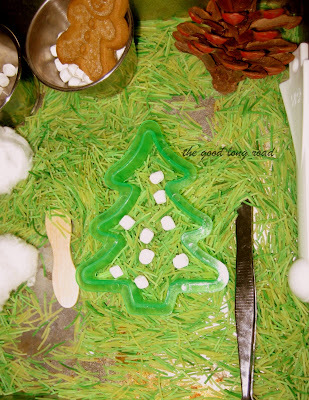 Cotton Balls and super-mini marshmallows to represent snow - the soft feel of Christmas with the cotton balls and the mini marshmallows were great for a tweezer transferring exercise for fine motor skills (and in decorating the cookie cutter tree that I switched with my initial foam tree because I realized it could be filled for decorating). Rosemary Sprigs another item added to represent the look and smell of Christmas, since they look a bit like pine trees. A Painted Pine Cone leftover from a previous painting activity to also represent the unique look, smell and feel of Christmas as pine cones have a look, feel and smell all their own and have been major decorations in our house this Christmas. Wild Thing had lots of fun exploring this bin - moving around the pine needles, having me light the candles for him to blow out over and over, tasting the candy canes (he had never had one before), decorating the tree, seeing how many snowballs (Cotton Balls) would fit in the mitten (9 is the answer by the way), shaking the jingle bells and singing songs, having a snowball fight with the Cotton Balls (which does not hurt at all), and ultimately making a mountain. 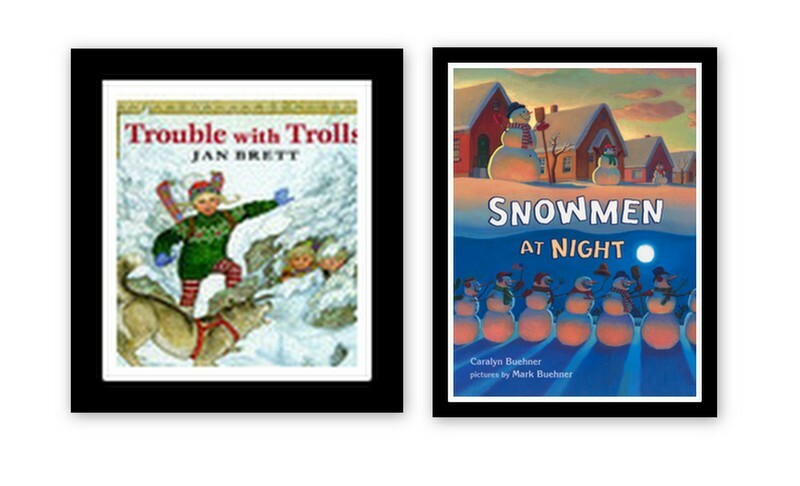 The snowball fight and mountain were inspired by two books we have been reading lately that Wild Thing absolutely loves: Snowmen at Night and Trouble with Trolls. In Snowmen at Night, the snowmen have a big snowball fight. Trouble with Trolls we discovered through the Virtual Book Club for Kids with Jan Brett being the author for December. In this fun book, the lead character travels up a mountain, so Wild Thing wanted to create the mountain that all of the adventure happens on -- we will be sharing more activities inspired by this great book on the blog later today! I LOVE the dollar stores. So many bargains. Thanks for sharing. Looks like fun at your house. 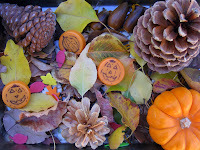 What wonderful elements to add to the bin! I love the dollar store too. What a neat bin! I love both of those books! I think the Dollar Store is my favourite store! There is SO MUCH GOOD STUFF there! I love how you included items to be explored with all five senses. I've never thought to use scented candles before but I'll definitely be using them for our next bin. Hi there, all the way from the Middle East! 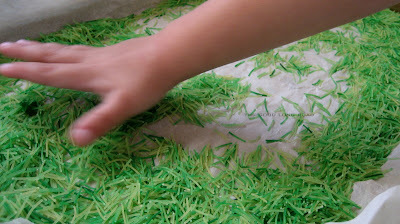 I just read up on your Christmas sensory experience and tried coloring angel hair pasta (we call it vermicilli) here - turns out my 1 1/2 year old enjoyed the experience of dyeing it green, so thank you for the idea! What a thoughtful and creative Christmas sensory bin! 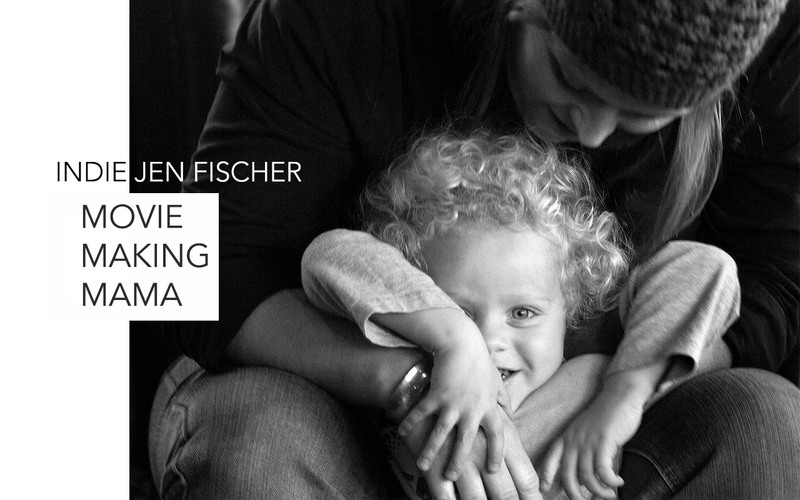 Busy, Young, Single Momma Sanity here! 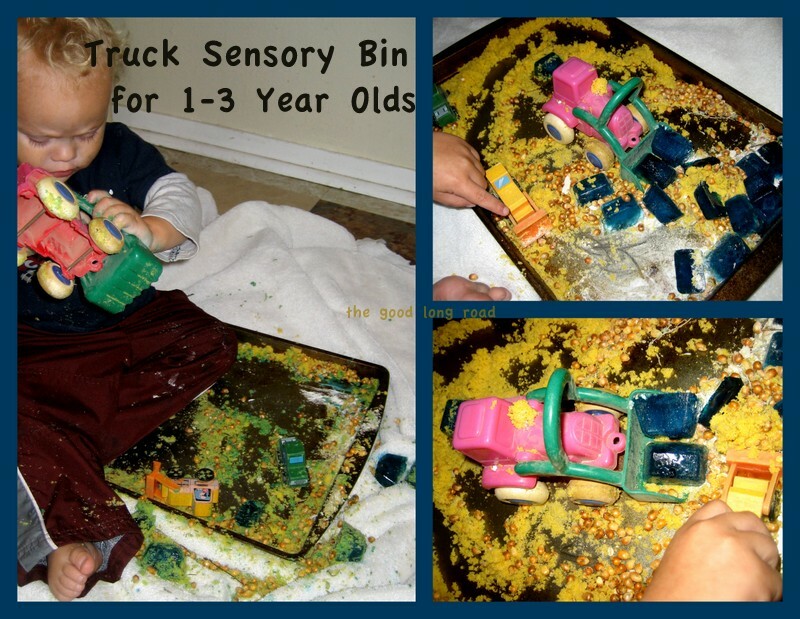 Just had to check out your Christmas Sensory bin. I absolutely adore it, and the fact that its filled with dollar store items! Looks like fun! Green pasta, did you get to eat it? Just kidding! My son would love it, he's obsessed with the color green. Thank you for joining the Learn Through Play hop! 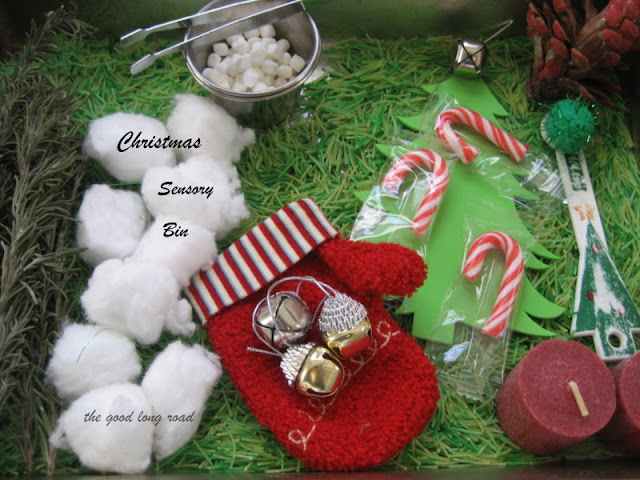 Great idea of a Christmas sensory bin - and at minimal costs - for young kids.